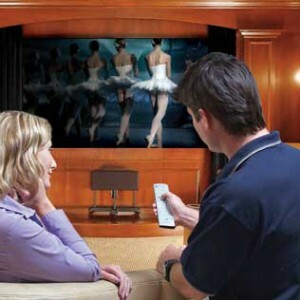 Home theatre installers install and repair a variety of home theater electronics equipment. Often, they are trained to service a wide variety of electronic equipment. In this free career guide, you will learn how to become a successful home theater installer. Electronic home entertainment equipment installers and repairers—also called service technicians—repair a variety of audio and video equipment. They may specialize in one type of product, or may be trained in many different ones. The most common products include televisions and radios, stereo components, digital video disc players, and video cameras. They also install and repair satellite television dishes and home theater systems, which consist of large-screen televisions and sophisticated surround-sound audio components. Customers usually bring small, portable equipment to repair shops for servicing. Repairers at these locations, known as bench technicians, are equipped with a full array of electronic tools and parts. When larger, less mobile equipment breaks down, customers may pay repairers to come to their homes. These repairers, known as field technicians, travel with a limited set of tools and parts, and attempt to complete the repair at the customer’s location. If the job is complex, technicians may bring defective components back to the shop for diagnosis and repair. When equipment breaks down, repairers check for defective components. If routine checks fail to locate the trouble, repairers may refer to schematics and manufacturers’ specifications that provide instructions on how to locate problems. Repairers may also use a variety of test equipment to diagnose and identify malfunctions. For example, multimeters detect short circuits, failed capacitors, and blown fuses by measuring voltage, current, and resistance. Color-bar and dot generators provide onscreen test patterns, and oscilloscopes and digital storage scopes measure complex waveforms produced by electronic equipment. Repairs may involve removing and replacing a failed transistor or fuse, often with hand tools, such as pliers, screwdrivers, soldering irons, and wrenches. Repairers also make adjustments to equipment, such as fine tuning the picture quality of a television set or the sound on a surround-sound system. Improvements in technology have miniaturized and digitized many audio and video recording devices. Miniaturization has made repair work significantly more difficult because both the components and the acceptable tolerances are smaller. Also, components now are mounted on the surface of circuit boards, instead of plugged into slots, requiring more precise soldering when a new part is installed. Improved technologies have lowered the price of electronic home entertainment equipment to the point where customers often replace broken equipment instead of repairing it. Work environment. Most repairers work in well-lighted electrical repair shops. Field technicians, however, spend much time traveling in service vehicles and working in customers’ residences. Employers prefer applicants who have knowledge of electronics, good problem-solving skills, and previous repair experience. Good customer service skills are essential for field technicians, as they spend a majority of their time working in customers’ homes. Certification is available for entry-level workers and experienced workers seeking advancement. Education and training. Employers prefer applicants who have knowledge and skills in electronics as well as previous repair experience. Many applicants gain these skills at vocational training programs and community colleges. Training programs should include both hands-on experience and theoretical education in digital consumer electronics. Entry-level repairers may work closely with more experienced technicians, who provide technical guidance. Other qualifications. Field technicians work closely with customers and must have good communication skills and a neat appearance. Repairers also must have good problem solving skills, as their main duty is to diagnose and solve problems. For home entertainment system installers, excellent vision and a keen sense of sound are important for fine-tuning the installed product. Employers usually require that field technicians have a driver’s license. Certification and advancement. A growing number of employers require applicants to be certified. Various organizations offer certification for electronic home entertainment equipment installers and repairers. For instance, the Electronics Technicians Association (ETA) offers certification programs in numerous electronics specialties, including Residential Electronics Systems Integrator. The International Society of Certified Electronics Technicians also offers certification in multimedia systems and electronic systems. To become certified, applicants must meet several prerequisites and pass a comprehensive written or online examination. Certification demonstrates a level of competency. It can make an applicant more attractive to employers or increase an employee’s opportunities for advancement. Experienced repairers with advanced training may become specialists or troubleshooters, helping other repairers to diagnose difficult problems. Workers with leadership ability may become supervisors of other repairers. Some experienced workers open their own repair shops. Electronic home entertainment equipment installers and repairers held about 51,200 jobs in 2008. Many repairers—about 33 percent—worked in the retail trade industry. About 26 percent of electronic home entertainment equipment installers and repairers were self-employed. Employment is expected to increase about as fast as average for all occupations. Job prospects will be best for applicants with certification, knowledge of electronics, related work experience, and good customer service skills. Employment change. Employment of electronic home entertainment equipment installers and repairers is expected to grow by 11 percent from 2008 to 2018, which is as fast as the average for all occupations. Demand will be driven by the rising sales of home entertainment equipment. Employment growth of home entertainment installers will be driven by consumer demand for sophisticated digital equipment, such as high definition televisions, video recorders, cameras, and camcorders. Home entertainment systems continue to grow in popularity and consumers’ desire for state-of-the-art sound and picture quality will further spur the need for installers. The need for repairers, however, is expected to grow slowly because home entertainment equipment is less expensive than in the past. As technological developments have lowered the price and improved the reliability of equipment, the demand for repair services has decreased. When a malfunction does occur, it is often cheaper for consumers to replace equipment than to pay for repairs. Job prospects. Job openings will arise from employment growth and from the need to replace workers who retire or who leave the occupation. Opportunities will be best for applicants with certification, knowledge of electronics, related hands-on experience, and good customer-service skills. Median hourly wages of wage-and-salary electronic home entertainment equipment installers and repairers were $15.42 in May 2008. The middle 50 percent earned between $12.09 and $19.64. The lowest 10 percent earned less than $9.90, and the highest 10 percent earned more than $24.13. In May 2008, median hourly wages of electronic home entertainment equipment installers and repairers in electrical and electronic goods merchant wholesalers were $17.19, and $16.17 in building equipment contractors.